Sun 78 RPM - Misc. I got them! 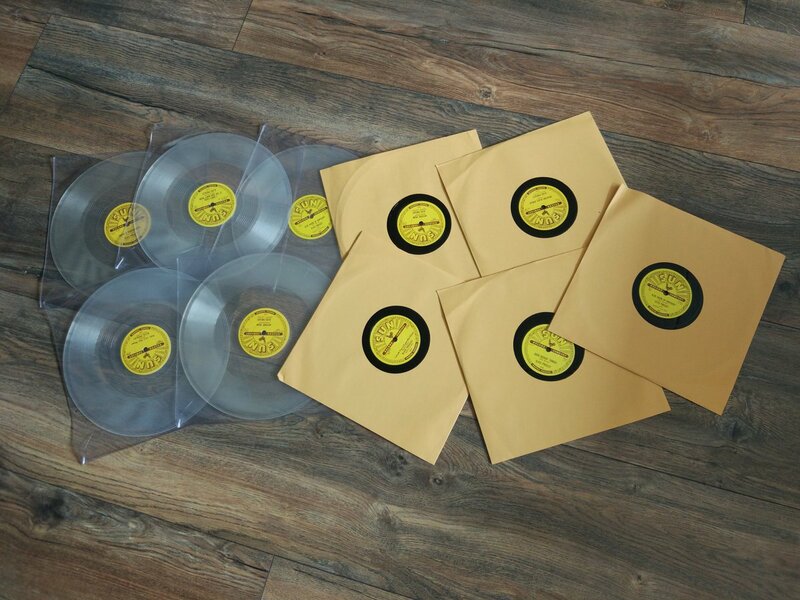 The Sun 78 RPM replicas that were released recently arrived and after I received my new record player (able to play them) also, I could enjoy them. Both sets look great, the black ones in their paper sleeves, like the originals and the transparent ones in plastic sleeves (even more transparent). The etched numbers makes it even look more "real". It's marvelous to see the turntable spinning that fast and making sound too. From the "flat" That's All Right to the last Sun record I Forgot To Remember To Forget / Mystery Train, all sound great. The only minor is that on both versions the label of Good Rockin' Tonight is switched with the flip side (at least in my sets). A fun collection that brightened up my day. Good for those that missed the originals and can't afford them now. Closer to them than this you won't get. I own 11 of them. 2 from USA and 9 from Canada. I am pleased to have and play them. Ain't it Funny How Time Slips Away ! I think this is a very good initiative for having released them. People who desire to buy will be pleased to do so. You Don't Know Me, would you pls be so kind to check with your friend if his set has the switched labels of Good Rockin' Tonight too ? I'm on the verge to buy them, but it would spoil a part of the pleasure knowing the set is not 100% flawless ! Thanks in advance ! Tempting as a friend of mine who has them thoroughly enjoyed them! Record Or Candy Shop Day?